Human beings go through a natural cycle of learning every time they learn something new. This is true whether it is a baby taking her first steps; a youngster learning to ride his bike; a college student tackling physics; or a manager learning how to increase her company's sales in China. There are different models of the learning cycle – some educators have proposed four phases, while others have proposed five – and the names can vary, too. What does not vary is that learning is negatively impacted if one or more of these phases in the learning process are ignored or poorly executed. 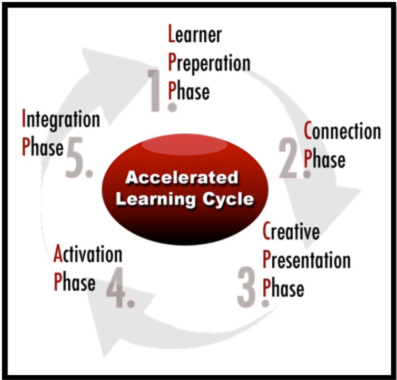 The Accelerated Learning Cycle presented here has been recognized by various researchers, educators, and training organizations. By applying the phases to training and curriculum design, learning becomes easier, faster and more enjoyable. When learners enter a classroom or start to study something on their own, their thoughts are usually far from the task-at-hand. They may be thinking about the conversation they had last night with family members; about the essay they have to write for a psychology class; or about the management problem that needs to be solved. Or they may simply be tired from a lack of sleep; or resentful about the time their class is taking away from the “regular” work schedule. The first step in the Accelerated Learning Cycle is to bring the learners’ attention into the moment so they can focus on the learning ahead of them. Learners bring in their entire past “school experience” – whether positive or painful – when they enter a training session or when they begin a new learning task. During this phase, learners may need to be guided to connect with the instructor, the learning environment, and the purposeful benefit of the training. It is important to note that if the learners do not feel safe and welcomed in the class, they can set up mental barriers to learning that may be difficult to overcome. If learners do not understand the relevance of the information to their own life or job, or if they are not excited and curious about the content, they may avert the holistic benefit that might have been realized from the learning experience. This is the phase of learning in which trainers share new material in ways that are interesting, challenging, and relevant to trainees’ lives. Effective trainers use a variety of methods that draw on multiple intelligences, learning styles, and the five senses (smell, taste, sight, sound, touch). Effectual instructors know how to encourage learners to collaborate with each other; put together team projects; and observe and solve real-life problems. This is the practice phase, in which the instructor guides learners to integrate new material into their own knowledge database. The goal here is for learners to build mastery of skills or knowledge through repetitive practices that are not tedious or dependent solely on rote-memory. In this phase, the trainer encourages learners to experiment in a safe and supportive environment; make mistakes; get feedback; and build competence. During this phase, learners review everything they have learned and celebrate how far they have come. Learners commemorate the answers they have found or the new questions they have discovered. They begin to explore how they will use the learning “back home.” In fact, many of the lessons learned may ideally be actualized long after the initial training session is over and might even include on-going peer coaching for the empowerment of others.